This post is sponsored by Just A Splash. 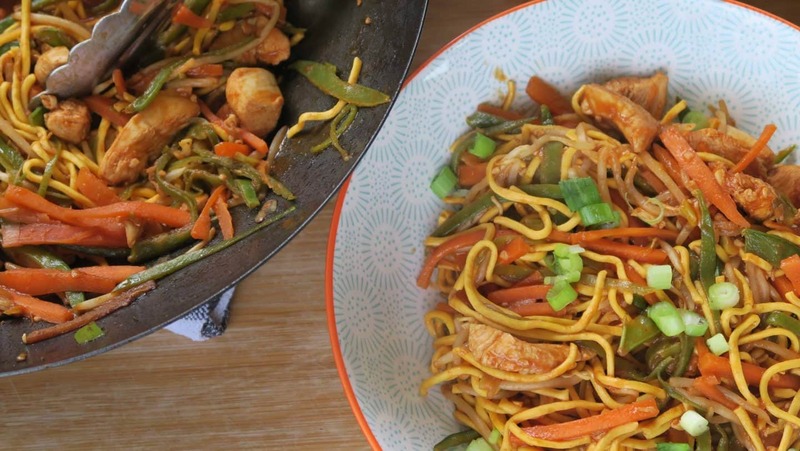 I’ve been wanting to make a gluten free chicken chow mein recipe for a long time. I love Chinese food and with coeliac disease finding a safe, gluten free Chinese takeaway is virtually impossible. I was always put off making a chow mein because to make it properly, you need sherry, and I didn’t want to buy a whole bottle for the rest to go to waste. 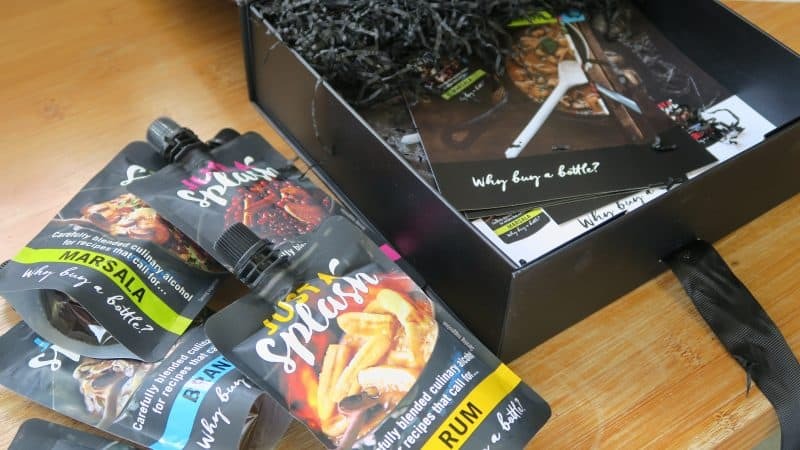 Luckily for me, I’ve teamed up with Just A Splash to prove that cooking with alcohol doesn’t have to be expensive! When Just A Splash contacted me asking to collaborate on a recipe, it was like they literally answered my prayers. In a freaky coincidence, the day before the email dropped in my inbox, I had been discussing with my Mum how I wanted to make a gluten free chicken chow mein, but all the recipes I had found called for sherry. 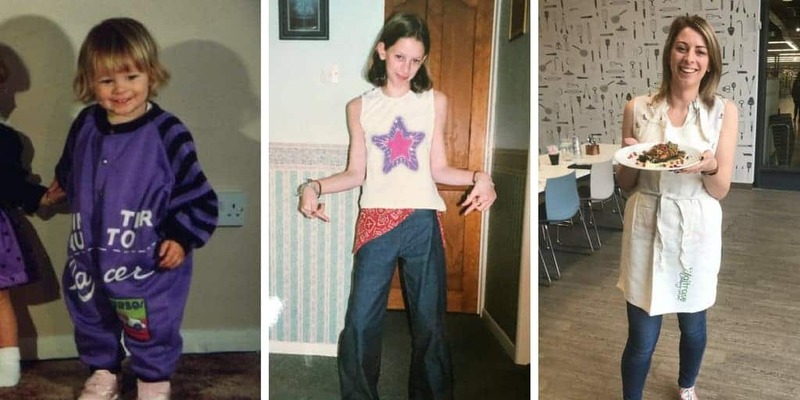 As someone who rarely drinks sprits, I didn’t want to spend £10-£15 on a bottle of alcohol, only to use a few tablespoons, and have the nearly-full bottle in my cupboard for years. What a waste of kitchen space and my precious pennies! So when Just A Splash contacted me and told me about their 100ml pouches of alcohol, I had to do a double-take at the screen. Was my house bugged!? I love cooking with alcohol as it brings so much flavour to a dish, but the cost of buying a bottle always put me off. But now, it seems, there is finally an answer which meant only one thing – time to make my gluten free chicken chow mein! 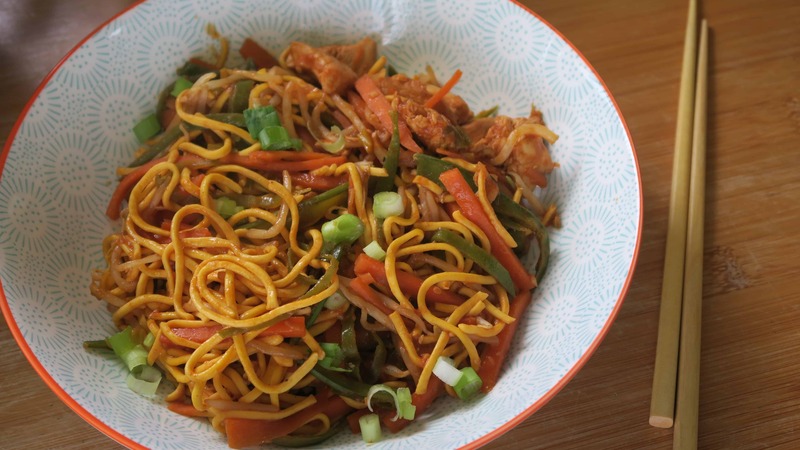 I’ve wanted to make a gluten free chow mein for a long, long time. Gluten free Chinese food is always hard to come by and unless you’ve got an awesome take-away near you, it’s pretty much a no go if you have coeliac disease. Which was why I was so excited to be able to make a gluten free chow mein Steve and I could both enjoy for our own ‘fake-away’ night. For this recipe, I used the Just A Splash sherry pouch, which was just enough for the marinade and the sauce. It may look like this recipe has more ingredients that my normal recipes, but actually a lot of these are store-cupboard items you’ll probably already have! For example, tomato ketchup, gluten free soy sauce, garlic, white pepper – it’s so simple to throw together. 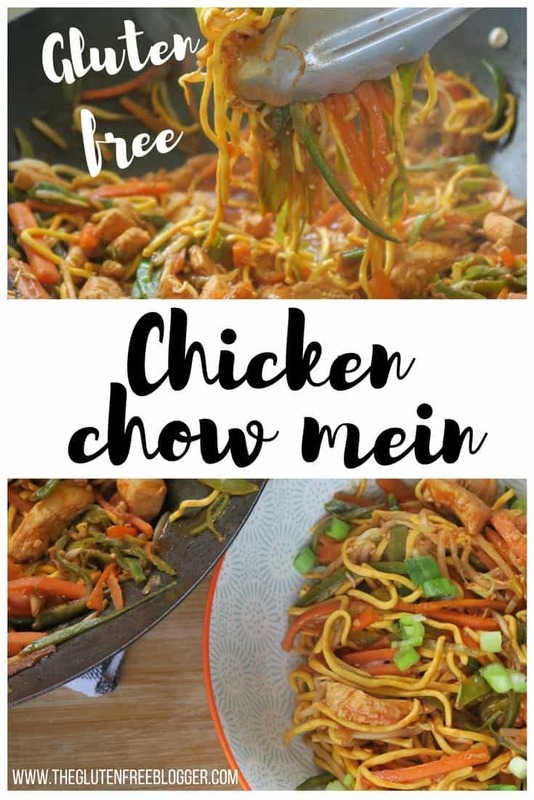 This is a really easy chow mein recipe, and although I’ve used chicken you could substitute this for tofu or quorn for a vegetarian version – or prawns, beef or pork if you fancied something different. For the noodles, I used the Oomi protein noodles as I prefer the texture, but this would work just as well with gluten free rice noodles too. It’s a super versatile dish! 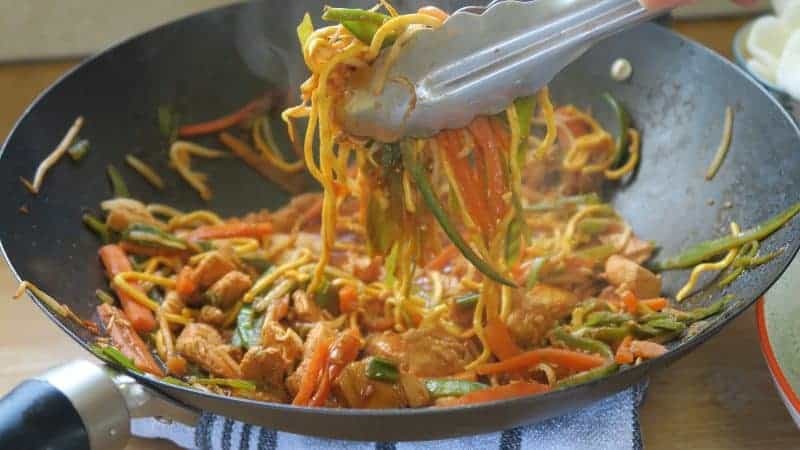 This easy gluten free chicken chow mein is super tasty and a great Chinese 'fake-away' for people with coeliac disease. Made with Just A Splash of sherry. First make the marinade. Combine all of the marinade ingredients together in a large bowl or glass tub and mix well. Chop the chicken into small pieces and add to the marinade. Mix well so the chicken is coated and leave to marinade for at least an hour. For best results, make the night before and leave overnight for the flavours to soak in. When you're ready to cook, add the sauce ingredients to a bowl or mug and mix well until combined. Set aside. Heat the sesame oil in a wok until hot and starting to smoke. Add the chicken and stir fry for around 2 minutes. Next add the carrots, mange tout and spring onions. Continue stir-frying on a high heat for 2-3 minutes. Add the sauce to the pan, allow it to start bubbling then stir it well. Add the noodles and beansprouts to the wok and stir. Keep stirring for a minute until everything is fully coated in the sauce. Remove from the heat and serve immediately. Goes very well with some gluten free prawn crackers and some extra, chopped spring onions on top. This recipe serves two people as a full meal, or would serve four if you were making a selection of dishes in true Chinese 'fakeaway' style! 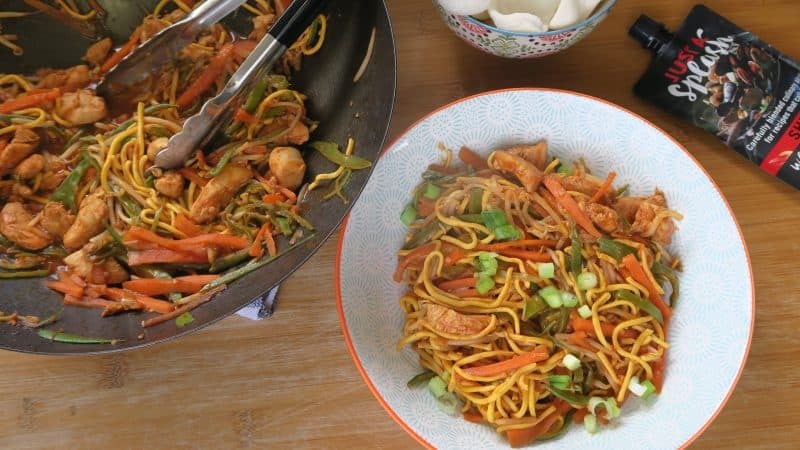 See, a perfect gluten free chicken chow mein recipe without having to buy a whole bottle of sherry and losing out on £10! 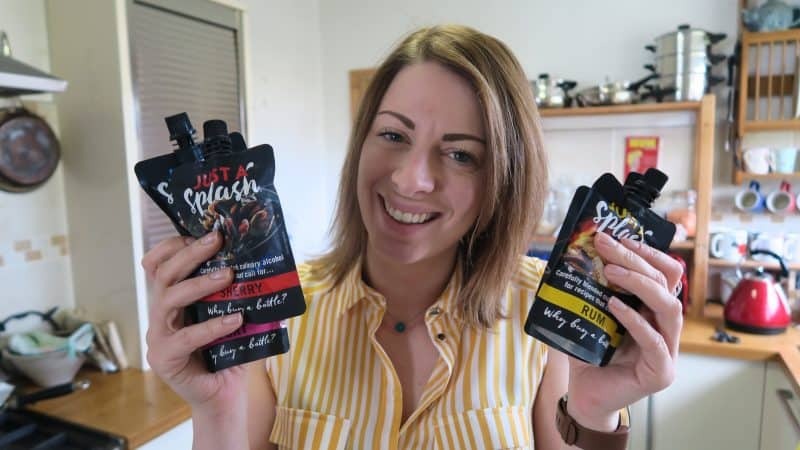 You can buy the Just A Splash pouches (available in 100ml of sherry, port, rum, brandy and marsala) from Ocado for £1.99 each. What are you waiting for? I’m already planning what to make with the rest of my pouches as I have one in each variety, but if you have any ideas I’d love to hear them! 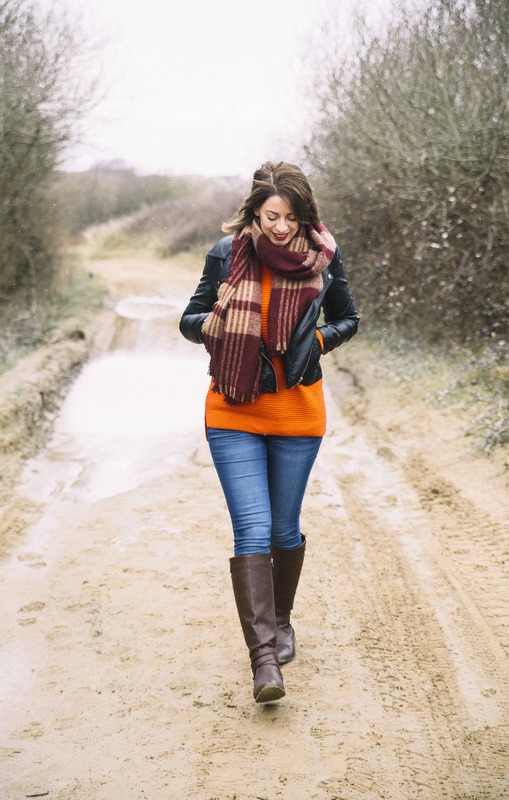 I’d love to see your creations if you give this a go – you can share them in my Facebook group or tag me on Instagram using #theglutenfreeblogger. I’ll always share your photos when you make my recipes! And if you want something to pair this with, why not try my gluten free Singapore fried rice? This post has been sponsored by Just A Splash. I sometimes accept sponsored posts with brands I love and trust, but my opinions are always my own. Two super simple fruity ice-lollies to enjoy in the sun! Hi, this looks delicious. Could I ask which gluten free noodles you used, as an egg noodle replacement (rather than rice noodles) is something I haven’t figured out yet… Thank you.